In July 2000, Mark Belnick, then the top in-house lawyer at Tyco International Ltd., received a $2 million payment toward a $12 million bonus. For Mr. Belnick, it was the latest reward in a meteoric legal career that ran from some of the highest-profile business cases of the 1980s and 1990s to Tyco, a hugely successful conglomerate and Wall Street darling. Today prosecutors say that payment bought Mr. Belnick's silence about the looting of Tyco by its extravagant former chief executive, L. Dennis Kozlowski. Mr. Belnick, facing criminal charges, has become one of the most celebrated casualties of the recent wave of corporate wrongdoing. But few people know just what he did with that $2 million. Almost immediately, he gave most of it to a small Catholic college in California and to the Culture of Life Foundation, a Catholic pro-life group in Washington, according to e-mails to and from Mr. Belnick at the time and interviews with people involved with the donations. Three months earlier, Mr. Belnick, formerly an observant Jew, had quietly converted to Catholicism and become an active supporter of Opus Dei, a conservative group within the church. While prosecutors accuse his boss, Mr. Kozlowski, of taking millions from Tyco to buy artwork and posh homes and to entertain friends in Sardinia, Mr. Belnick was using some of his allegedly unlawful Tyco haul for an entirely different purpose. In addition to his donations to the Catholic college and foundation, he gave money to a Catholic television network, two parishes and an Opus Dei bookstore and information center. It was all part of a midlife transformation that Mr. Belnick, the former president of a suburban Westchester, N.Y., synagogue, long kept secret from most of his friends and even his own family. For Mr. Belnick, two journeys intersected at Tyco: He became embroiled in one of the messiest corporate scandals ever, and simultaneously pursued a sudden conversion and devotion to Catholic philanthropy. As a partner at prestigious New York law firm Paul, Weiss, Rifkind, Wharton & Garrison, he rose to the pinnacle of corporate litigation, and gained national acclaim when his mentor Arthur Liman tapped him to help lead the long U.S. Senate investigation of the Iran-Contra affair. Mark Belnick, former general counsel of Tyco International Ltd., and his wife, Randy, leave New York state court last September after a hearing in the criminal case against him. But he wanted more. With stocks and corporate pay booming, he gave up his partnership to join Mr. Kozlowski at a company that promised one of the business world's most lucrative paydays. Tyco's stock was soaring as it gobbled up one industrial company after another, and under Mr. Kozlowski, its compensation packages were unusually rich. Before long, prosecutors say, a lawyer with a sterling reputation for integrity was helping Mr. Kozlowski pull off one of the biggest corporate ransackings ever. In his three years and nine months at Tyco, Mr. Belnick made $37.2 million, not including $14 million in no-interest loans from the company. Meanwhile, Mr. Belnick's more-personal journey was taking an unexpected turn. He serendipitously met a charismatic stockbroker-turned-priest who specialized in converting the rich and famous to Catholicism. Mr. Belnick took the plunge. "I've never felt so exhilarated -- not since my bar mitzvah," Mr. Belnick e-mailed Father C. John McCloskey III before being baptized in April 2000. A little more than a year later, the convert attended mass with the Pope in his private chapel in Rome. Mr. Belnick joined an elite fraternity of Father McCloskey's converts. Others include Lawrence Kudlow, the economist and television commentator; Sen. Sam Brownback of Kansas and conservative political columnist Robert Novak. Bernard Nathanson, a onetime abortion doctor and pro-choice advocate who became a Catholic with the priest's guidance, helped counsel Mr. Belnick on his conversion. At Father McCloskey's behest, Mr. Belnick himself tried to persuade other prominent people -- including former Nebraska Sen. Bob Kerrey -- to join the Catholic faith. When Tyco's fortunes fell, and Mr. Belnick's position there began to crumble, he sought succor from the priest. "Remember, you are bigger than Tyco," Father McCloskey responded in a Jan. 31, 2002, e-mail to Mr. Belnick. "It does not have an immortal soul." Today, the 56-year-old lawyer faces prosecution by the Manhattan district attorney's office for grand larceny. If convicted, he could be sentenced to 25 years in prison. Mr. Belnick has pleaded not guilty and through his lawyer, Reid Weingarten, declines to comment. A trial is scheduled for early next year. "I and everyone who ever worked with Mark think he's a person of absolute integrity and impeccable judgment, and I'd be shocked if these criminal charges are true," says Warren B. Rudman, the former senator from New Hampshire who was co-chairman of the Iran-Contra committee and became one of Mr. Belnick's partners at the well-known Paul Weiss law firm. After graduating from Cornell and Columbia Law School, Mr. Belnick signed on with Paul Weiss. He impressed colleagues with his work on such engagements as representing Pennzoil in its mammoth litigation against Texaco in the mid-1980s. The young lawyer became a protege of Mr. Liman, a titan of the New York bar, famous both for his courtroom prowess and boardroom advice. 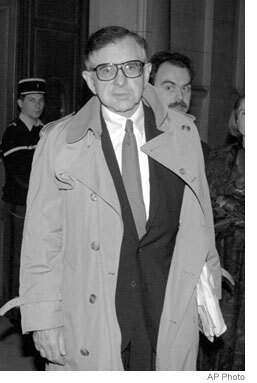 In 1987, when Mr. Liman was named chief counsel of the Senate Iran-Contra panel, he tapped Mr. Belnick, by then himself a Paul Weiss partner, as his deputy. "Mark is brilliant and witty," Mr. Liman told the publication Legal Times. On Capitol Hill, "Mark was spit and polish, just the opposite" of the often-rumpled Mr. Liman, recalls Timothy Woodcock, then an associate counsel with the special Senate committee. The pair from New York meshed well. "Sometimes you needed an interpreter to figure out what Arthur was thinking," says W. Thomas McGough Jr., another committee lawyer. "Mark channeled Arthur, and Arthur trusted no one else." But after gaining national attention for his Iran-Contra role, life back at the law firm didn't seem as exhilarating to Mr. Belnick, former colleagues say. He grew restless. In 1993, when his alma mater Cornell asked him to be its general counsel, Mr. Belnick took the assignment. The move meant earning just a bit more than a third of his Paul Weiss compensation at that time of about $600,000. But Mr. Belnick lasted a total of only five days on Cornell's upstate Ithaca, N.Y., campus. The weekend after he began, Mr. Belnick phoned startled university co-workers to announce his departure, effective immediately, according to two former colleagues. "When he got there, he realized it was Ithaca, not Manhattan, and that he was required to go to meetings every moment," says Martin London, a Paul Weiss partner. Father C. John McCloskey III, a Washington priest, helped Messrs. Nathanson and Belnick, among other prominent and wealthy people, through the conversion process. Mr. Belnick returned to the firm, which was emerging as one of the powerhouse legal partnerships of the go-go 1990s. In 1995, he helped Mr. Rudman overhaul the then-scandal-ridden Nasdaq Stock Market. Later, Mr. Belnick represented Salomon Smith Barney Inc. in settling the largest-ever class-action sexual-discrimination lawsuit, filed by women claiming they were paid less than men and promoted less frequently. Then, in July 1997, Mr. Liman died of cancer at 64. Mr. Belnick delivered an emotional eulogy to an audience of hundreds at a memorial service at New York's Park Avenue Synagogue. "Mark loved Arthur like a brother," Mr. London says. "When Arthur died, the music went out of Mark's practice, and he didn't want to work as hard." Though well-paid even by New York law firm standards -- as much as $900,000 a year -- Mr. Belnick complained to colleagues he was undercompensated by the firm's post-Liman leadership, Paul Weiss partners say. He began looking around for another job. In the summer of 1998, Mr. Rudman told him that L. Dennis Kozlowski, a Rudman friend, was scouting for a general counsel for his fast-growing conglomerate, Tyco. The company owned businesses in electronic security, packaging equipment, medical products and other disparate lines. Mr. Kozlowski made Mr. Belnick a rich offer: A three-year contract for $5.9 million in cash and bonuses, and millions more in stock and options. 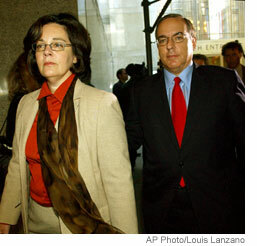 "I loved Paul Weiss, but the opportunity at Tyco was too good," Mr. Belnick told The National Law Journal at the time. The deal improved before his Sept. 15 start date. Although Mr. Belnick lived with his family in suburban Harrison, N.Y., only 25 miles from Tyco's Manhattan office, Mr. Kozlowski approved a $4 million relocation loan, on which interest was later forgiven. That helped Mr. Belnick purchase a New York apartment on Central Park West -- a favor prosecutors have said in court papers violated the company's own relocation policy. The lucrative change in Mr. Belnick's professional life coincided with one already under way in his spiritual life. In 1996, while still at Paul Weiss, he had become fascinated by Catholicism. Mr. Belnick grew up in the middle-class New York suburb of Linden, N.J. His accountant father and schoolteacher mother took Mark and his two younger siblings to the town's only orthodox synagogue. Theodore Rosenberg, now administrator of Congregation Anshe Chesed, attended both Hebrew lessons and public school with Mr. Belnick. He recalls his schoolmate as fluent in Hebrew and "quite bright." Years later, as a successful lawyer living with his wife and three children in well-to-do Harrison, Mr. Belnick helped lead the conservative Jewish Community Center there, serving as the congregation's president for four years in the late 1980s. He attended adult religious classes. The lawyer contributed money as well as time. The American Jewish Committee bestowed a human-relations award on him in 1988, in recognition of his philanthropy. The United Jewish Appeal had earlier named him to its National Young Leadership Cabinet. "He wasn't a passive Jew," says Bernard Dienstag, cantor emeritus of the Harrison Jewish center. "He supported everything Jewish with so much enthusiasm." But by 1996, Mr. Belnick began to reconsider his faith. In numerous e-mails reviewed by The Wall Street Journal, he said at the time that his main inspiration came from Maureen Hartman, then the wife of David Hartman, the former host of the ABC television talk show "Good Morning America." The Hartmans and Belnicks had become friends years earlier, when their children attended the same private day school in Westchester, N.Y. Mr. Hartman said in an interview that his wife, a devout Catholic, began speaking with Mr. Belnick about her faith in 1996, before she knew she had brain cancer. "Mark picked up on something she said and, being as intellectually curious as he is," he began learning about Catholicism, Mr. Hartman says. Weeks before her September 1997 death, Mrs. Hartman gave Mr. Belnick her brown scapular, a religious accessory worn beneath regular clothes that symbolizes devotion to Mary, mother of Jesus. In an April 9, 2000, e-mail to Father McCloskey, Mr. Belnick said that the moment "I first put on the brown scapular to pray for my great friend" was "the instant this journey began." Mr. Belnick apparently had met Father McCloskey in late 1997, by mistake, after sending the priest an e-mail he intended for another clergyman with a similar name. In a separate e-mail to Father McCloskey, the lawyer later wrote, "I thank God every day for the gift of mistaken e-mail addresses." In an interview, Father McCloskey declines to say how the two met. "I know him; I received him into the church, and I think he's a man of sterling character and family life," the priest says. Father McCloskey, 49, belongs to Opus Dei, a group founded in 1928 by Josemaria Escriva, a Spanish priest canonized last year by Pope John Paul II. Opus Dei, which has 3,000 members in the U.S., emphasizes donations to the church, fidelity to the Pope and spreading the faith, especially in the workplace. The group generally opposes change of traditional church doctrine. Father McCloskey, who has an economics degree from Columbia, worked as a stockbroker for Merrill Lynch & Co. in the late 1970s, before joining the priesthood in 1981. His official job is running the Catholic Information Center of the Archdiocese of Washington. But he is best known for shepherding prominent people into the church. "The Holy Spirit uses me as a conduit," says the priest, whom many refer to by his first initial and middle name. "C. John is the most effective converter of high-profile people in the country," says Dr. Nathanson, who, decades before his 1996 conversion from Judaism, had helped start the organization now known as the National Abortion Rights Action League. "He wants to bring well-educated, affluent people to the Pope." Some of the others the priest has helped through the conversion process are conservative publishing executive Alfred Regnery and financier Lewis Lehrman. Father McCloskey says that his Wall Street experience, as well as church postings in Manhattan, Princeton, N.J., and now Washington "put me in a circle I wouldn't otherwise be in." The priest acted swiftly to build on his accidental electronic meeting with Mr. Belnick. Both were prolific e-mailers. Sensing a potential convert, Father McCloskey invited the lawyer to Opus Dei retreats in Massachusetts and Maryland. In January 1998, Mr. Belnick declared himself a "cooperator" of Opus Dei, which a spokesman for the movement describes as someone who, while not a member, wishes to help Opus Dei "through prayers and contributions." Dr. Nathanson recalls several talks about religion with Mr. Belnick at the lawyer's Paul Weiss office in New York. He says Mr. Belnick told him he loved Catholicism's "ceremony, rituals and complex theological schema, which challenges and comforts." The lawyer had kept his new interest in Catholicism secret from most of his friends and acquaintances. Even after his conversion was first reported by the Journal last September, Mr. Belnick phoned his former rabbi, Norton Shargel, to deny it, according to people the rabbi subsequently spoke with. The secrecy, Dr. Nathanson says, related largely to Mr. Belnick's elderly parents: "His parents are still alive, and he did tell me that was a tremendous obstacle." Shortly before his conversion ceremony, Mr. Belnick e-mailed Father McCloskey, "Please pray that my parents live another 120 years in perfect ignorance of this event." At Tyco, the company's in-house mergers-and-acquisitions lawyers didn't like the newcomer and refused to report to him, according to people familiar with the situation. Mr. Belnick quickly lost the support of Joshua Berman, a lawyer and Tyco director at the time who had Mr. Kozlowski's ear. For years, Mr. Berman's law firm, Kramer, Levin, Naftalis & Frankel, served as Tyco's main outside counsel. But Mr. Belnick retained several rival law firms, which he used in addition to Kramer Levin and which boosted Tyco's legal fees. Mr. Berman sometimes asked Mr. Kozlowski what Mr. Belnick did all day. Mr. Kozlowski would respond that he didn't know, according to people privy to these conversations. Stephen Kaufman, a lawyer for Mr. Kozlowski, declines to comment. Mr. Berman says he believed Mr. Belnick "wasn't doing a good job" and that he was bothered because "Tyco's legal fees were growing exponentially" under Mr. Belnick's supervision. Mr. Kozlowski considered firing his general counsel in 1999, Tyco documents show. But as the chief executive explained to Mr. Berman and others, he didn't want to offend Mr. Rudman, who remained friendly with Mr. Belnick. For his part, Mr. Belnick apparently didn't learn of his boss's consideration of ousting him until later. And on Sept. 30, 1999, he received the first of several huge Tyco payouts: $3.4 million from the sale of restricted company shares. Six days later, he e-mailed Father McCloskey to say, "I'm sending you my check for $2M towards my pledge to the new Sanctuary/Altar" in the Catholic Information Center in Washington. Asked to clarify the amount of this pledge, Father McCloskey says Mr. Belnick's donation was "a minimal amount" and declines to be specific. Bernard Nathanson, a former abortion-rights activist, converted to Catholicism and discussed Mr. Belnick's conversion with the lawyer. In November 1999, Tyco's accounting practices began attracting skeptical press reports, and the Securities and Exchange Commission launched a probe. After reading newspaper articles about the company's troubles, Father McCloskey wrote in a Nov. 2, 1999, e-mail to Mr. Belnick, "I pray that you are weathering well the Tyco tempest." In a reply e-mail three days later, Mr. Belnick blamed the government inquiry on "rumormongers." He added that Tyco's woes were "nothing compared to the problems of Mother Teresa's earthly charges or the glory of Her Boss." To respond to the SEC's voluminous requests for Tyco documents, Mr. Belnick retained his late mentor's son, Lewis Liman, a former assistant U.S. attorney, and William McLucas, former SEC enforcement chief. Both are partners with the Washington-based law firm of Wilmer, Cutler & Pickering. Mr. Belnick remained actively involved in dealings with the government. According to Tyco e-mails written during the probe, Mr. Liman warned Mr. Belnick in March 2000 that a document kept among others that were sought by the SEC showed that Tyco had made payments to a woman whom other employees described as Mr. Kozlowski's "girlfriend." Mr. Belnick fired back that if the document was "non-responsive," meaning that it didn't correspond specifically to an SEC request, "why should we produce it?" Other Tyco documents unearthed during the SEC probe revealed that Mr. Kozlowski had spent nearly $1 million of Tyco money on himself, his girlfriend and his family, prosecutors allege. The documents also allegedly showed accounting improprieties. When the outside lawyers, Messrs. Liman and McLucas, asked Mr. Belnick about these expenses, he misled them by saying Tyco policies allowed the payments and that Mr. Kozlowski would pay the money back, prosecutors say. Mr. Kozlowski, meanwhile, agreed in July to have Tyco give Mr. Belnick a $12 million "special, performance-based bonus." Prosecutors allege that the bonus was a reward for "concealing" Mr. Kozlowski's misuse of Tyco funds. Mr. Belnick's lawyer, Mr. Weingarten, says his client earned the money for his role in representing the company during the SEC probe. On July 13, 2000, the SEC inquiry ended with no government action taken against Tyco. That day, Mr. Belnick wrote a memo to Tyco's top human-resources executive, seeking payment of the $12 million bonus. He asked for $2 million in cash to be wired immediately to his bank account, according to a Tyco document filed in state court. Also that day, Mr. Belnick sent an e-mail to Father McCloskey. "Justice triumphs -- and the Founder comes through again!" the lawyer wrote. Before the SEC investigation concluded, Mr. Belnick was gearing up for the culmination of the spiritual journey that had begun three years earlier. He planned to convert to Catholicism on Feb. 28, 2000. But four days before he was to be baptized, he lamented in an e-mail to Father McCloskey that he lacked "spousal consent." In the early morning hours of the 28th, Mr. Belnick for the first time told his wife that he planned to become a Catholic, according to e-mails he sent to Father McCloskey and others. Randy Belnick, who is Jewish and had married her husband 26 years earlier, didn't take the news well. Mr. Belnick wrote to Father McCloskey just before seven that morning: "I spoke to Randy forthrightly. She was extremely upset. I should have had this discussion, as you suggested, so many times, before setting this date. I cannot go forward today. My heart is broken." A month later, Mrs. Belnick did give her permission -- although not her approval, according to e-mail her husband sent to Father McCloskey. At one o'clock in the afternoon on Tuesday, April 25, Mr. Belnick was baptized in St. Thomas More Church on Manhattan's Upper East Side. The event was attended by some 20 people -- those Mr. Belnick describes as "most important to me on this journey." Among them were Mr. Lehrman, Dr. Nathanson and Bowie Kuhn, the former baseball commissioner, who is also a devout Catholic. Notably absent were Mr. Belnick's three children, who knew nothing about the event, according to family friends. Randy Belnick wasn't there, either, as the proceedings began. But halfway through the mass, Mrs. Belnick entered the church. "Mark gave her a huge hug, because he really wasn't expecting her," says Robert Best, a Washington Opus Dei member who attended. "There were a lot of tears shed by everyone at that moment." Mrs. Belnick didn't respond to repeated requests for comment. Mr. Belnick had met most of the guests through Father McCloskey. But there were two new Catholic friends who came from California for the ceremony whom he had met on his own: Thomas and Karen Dillon. Mr. Dillon is president of Thomas Aquinas College, a small Catholic school in Santa Paula, Calif. Mr. Belnick learned of the college in February 1998, while watching an interview with Mr. Dillon on EWTN -- Eternal World Television Network -- an Irondale, Ala.-based Catholic station, according to a spokeswoman for the college. Impressed by the school's focus on the "great books" of Western civilization, Mr. Belnick phoned Mr. Dillon to arrange a visit, a college spokeswoman says. In 1999, Thomas Aquinas put Mr. Belnick on its board of directors. "Belnick right off the bat came out with pockets open," giving hundreds of thousands of dollars, says James Barrett, a fellow board member. In July 2000, after he received the $2 million cash payment as part of his $12 million bonus from Tyco, Mr. Belnick gave most of the money to Thomas Aquinas and the Culture of Life Foundation, the Catholic pro-life group in Washington, according to e-mails and interviews. Thomas Aquinas listed Mr. Belnick in a press release as a "major benefactor" of a $3.6 million residence hall for men that opened in January 2002. He persuaded three of Tyco's outside law firms, Wilmer Cutler and New York's Cravath, Swaine & Moore and Milbank, Tweed, Hadley & McCloy to make a total of about $20,000 in donations to Thomas Aquinas to mark the college's 30th anniversary in September 2001, according to people at both firms. Father McCloskey introduced Mr. Belnick to a number of Catholic fundraisers to whose organizations the lawyer made substantial contributions, according to their e-mail. One was Mary Cunningham Agee, former vice president of strategic planning at Bendix Corp. and the wife of former Bendix Chairman William Agee. Ms. Agee says Mr. Belnick "was very generous" to the Culture of Life Foundation, on whose board she serves as vice chairman. She declines to say how much Mr. Belnick, who also formerly served on the board, donated to the group. Mr. Belnick also paid for programming Father McCloskey did for EWTN, and gave money to the Catholic Information Center and to a Catholic-oriented political action committee in Ann Arbor, Mich., begun by Domino's Pizza founder Thomas Monaghan and Mr. Kuhn. Mr. Belnick's professional and spiritual lives increasingly overlapped. On a May 2000 overseas trip for Tyco, he attended meetings Father McCloskey set up for him with Opus Dei priests in Singapore, Japan and Australia. Back in New York, he studied Catholicism with another priest who visited his Tyco office on some weekday afternoons. And just as Father McCloskey had urged Dr. Nathanson to help guide Mr. Belnick toward conversion, the priest urged Mr. Belnick to prod others along, too. Among them were a Jewish lawyer in Washington and Mr. Kerrey, the former Democratic senator from Nebraska who is now president of the New School University in New York. "Give Senator Bob Kerrey a call," Father McCloskey wrote Mr. Belnick in February 2001. "He is interested in the Faith and your example may help." Mr. Kerrey recalls meeting with Mr. Belnick that spring. "He was a very interesting, likeable, clear-thinking guy, who spoke about how faith changed his life," says Mr. Kerrey. In the end, however, Mr. Kerrey says he concluded, "It can't be that good." For Mr. Belnick, a spiritual high point came in May 2001, when he and his wife Randy attended mass with Pope John Paul II in the pontiff's private chapel. An Opus Dei priest in Rome who is close to the pope arranged the ceremony, according to the lawyer's e-mail to Father McCloskey and others. Mr. Belnick later told friends that even though his wife resisted his conversion, she was so moved by being in the pope's presence that she felt "chills." For his own part, the lawyer said in an e-mail to Father McCloskey, "This was no dream. It only seemed like one." In September 2001, Mr. Belnick received another interest-free "relocation loan" from Tyco, this one for $10.1 million, which he used to buy a luxurious home in the ski resort of Park City, Utah. He increasingly worked from his home there, even though Tyco didn't operate in the state. Mr. Belnick joined St. Mary's Parish Church in Park City and the Catholic Foundation of Utah, donating money to both. By early last year, Mr. Belnick knew his days at embattled Tyco were numbered. The company's stock fell sharply in January 2002, after media reports of a secret payment Mr. Kozlowski made to a company director. As Mr. Berman continued to press for Mr. Belnick's ouster, the general counsel retained his own lawyer to review details of his departure. Eventually, Messrs. Kozlowski and Belnick reached an agreement under which the general counsel would receive nearly $20 million as severance. The company board's compensation committee approved the arrangement. Mr. Rudman says Mr. Belnick told him that he planned to leave Tyco by October 2002. Father McCloskey continued to seek favors from his convert. On April 28, 2002, he asked Mr. Belnick to meet with fundraisers from Ave Maria School of Law in Ann Arbor, Mich. "Dear Fr. John, anything for you -- as long as it is understood that I am currently tapped out with huge pledges" to Thomas Aquinas College, two church parishes and other Catholic causes, Mr. Belnick responded. He added, "I sure need to see you." On June 10, Tyco fired Mr. Belnick. "All will be well," Father McCloskey assured in an e-mail that day. "I am praying for you intensely." Three months later, Mr. Belnick faced an initial round of criminal charges by New York prosecutors and a civil-fraud lawsuit filed by the SEC. Prosecutors accuse him of stealing the $12 million bonus from Tyco, which hadn't been approved by the company's board, as required by Tyco's by-laws. He is also charged with falsifying records by failing to disclose his relocation loans and compensation in federal securities filings. Prosecutors have taken testimony from Lewis Liman, the son of his late mentor. Mr. Weingarten, Mr. Belnick's lawyer, calls the charges "absurd." He says it wasn't his client's job to make sure the relocation loans and bonus were authorized by the Tyco board or disclosed to the SEC. Mr. Weingarten confirms that Mr. Belnick rejected a plea bargain late last year that would have required him to relinquish his law license. Since his Tyco dismissal, Mr. Belnick has been out of touch with some of the friends he made through the church. Mrs. Agee and Deal Hudson, editor of Crisis Magazine, a Catholic monthly, say they are praying for him, despite his failure to respond to e-mails and phone calls. Mr. Belnick visited Mr. Best during a mid-March trip to Washington. The Opus Dei member calls Mr. Belnick a "suffering soul." Father McCloskey says Mr. Belnick, who is spending most of his time in Park City these days, keeps in touch with him. "I'm not here to judge problems with the law, Tyco or Mark Belnick," the priest says. "I'm here to remind Mark that the Catholic Church is about suffering and when God allows suffering, it's for a purpose."